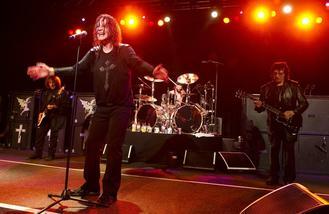 Black Sabbath postponed tour dates on the weekend because Ozzy Osbourne has an inflamed sinus. The frontman has taken ill with sinusitis which forced the heavy metal rockers to cancel gigs in Edmonton and Calgary on Saturday (30.01.16) and Sunday, however they have vowed they will reschedule the dates for later this year. Taking to their Twitter page, the band stated: "Due to extreme sinusitis with Ozzy the shows in Edmonton & Calgary have been postponed." Ozzy, 67, announced last year that this is the band's last ever tour, which is simply called 'The End'. And the singer - who hails from Birmingham in the UK - will finish the tour in Phoenix, USA, on September 21. Meanwhile, despite stating they would not follow up their 2013 LP titled '13' with more new music, Black Sabbath recently announced that they will make another record but it will only be available to buy at their special gigs. Bassist Geezer Butler told Billboard: "We thought we'd put out an album of 13 songs, but when we were in the studio we wrote another three songs, which brought it up to 16 and then we left it to Rick Rubin to pick which songs would go on the album, and to give it some light and shade he picked the eight songs that were on the 13 album. "We put a few songs on deluxe versions of the album and then we had the four left over, and we decided to do a gig-only CD." The band are also set to headline Download festival. Celine Dion will honour her husband at a tribute event in Las Vegas, according to reports. Fun Lovin' Criminals recorded their 1996 debut album 'Come Find Yourself' in less than a week. Harry Styles celebrated his 22nd birthday on Monday (01Feb16) by announcing he has split from his longtime managers. Jay Z's record label chiefs have launched a multi-million dollar court case against the rap mogul's former protege Rita Ora. Singer Christina Aguilera believes women need to find time to nurture themselves after giving birth. Chris Stapleton and Eric Church lead the nominations at the 51st annual Academy of Country Music Awards. Status Quo have announced their last ever electric tour. Craig David has recorded a track with WSTRN. Coldplay are to perform at BBC Radio 1's Big Weekend event.